Only one word I would use to describe my beautiful state of South Carolina. Never in my life have I seen such tragedy. People have lost everything in this flooding: their homes, their belongings, their cars. Roads are washed away, dams collapsed, homes destroyed, people evacuated, lives uprooted. In my hometown we got more than 10 inches of rain in 12 hours. Thankfully my house only suffered a few leaks that can easily be fixed. I can’t imagine how it would feel to lose it all. We are stranded because of roads being washed away. Even though we live in a higher-populated part of the state, we still have back roads that are used everyday that are now completely gone. Columbia is without water and will be for 3 to 4 days. Right now fire trucks are pumping water into hospitals to help keep the equipment cool and running. It will take months, even years, for our beautiful state to get back to normal. Mother Nature is so powerful; it blows my mind when I think about a rain storm of this magnitude and the destruction it has caused. It is being described as a weather event that hasn’t been seen or will be seen in thousands of years. Just a freak thing with the right conditions for disaster. Please pray for our state. Please pray for the families who have lost everything. 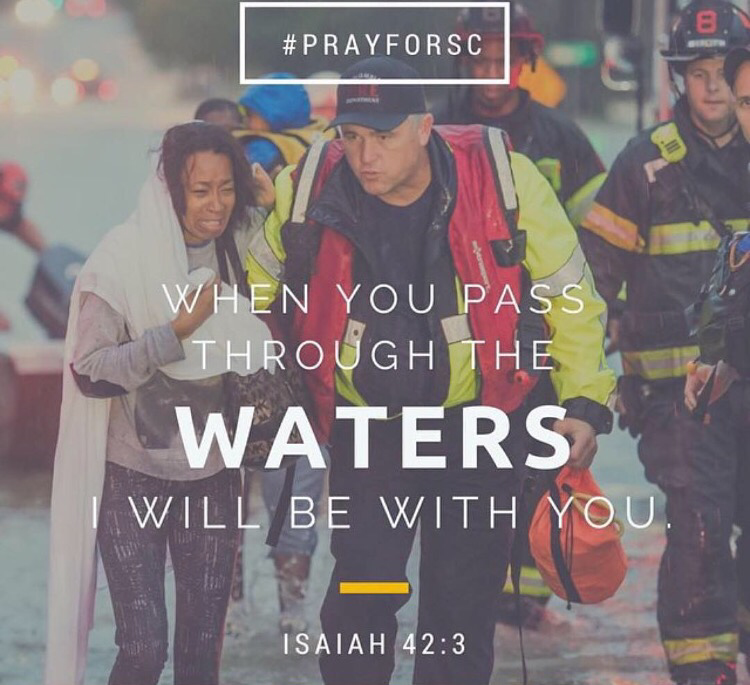 Please pray for the police officers, transportation workers, firefighters and other personnel who are working around the clock to help those in need. Prayers with you all. I love that verse.